As software becomes the competitive currency of the enterprise, investments are being made to embrace new distributed cloud applications, implement cloud platforms, and automate infrastructure provisioning. 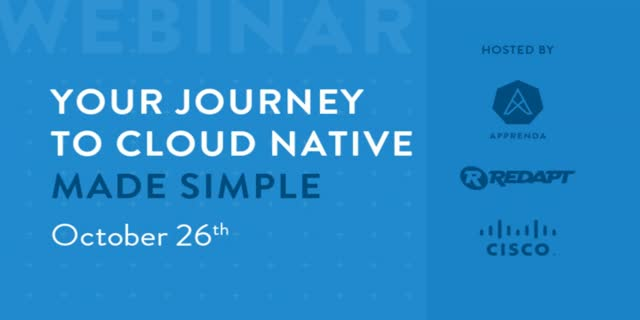 However, organizations are facing many challenges in regards to setting the correct path toward cloud native, delivering high quality & agile applications, all while keeping up with the increasing pace of business without sacrificing governance and operational efficiency. Cisco, Apprenda and Redapt have joined hands to offer an end-to-end solution to alleviate these challenges and transform your datacenter into a secure, policy-driven application cloud platform. A recent IDC global study shows that companies are becoming more sophisticated in how they think about cloud. However, in spite of the continued growth in cloud adoption, few organizations (less than 3%) are maximizing the value derived from their cloud environments. In this webcast, we will review some of the findings from IDC study derived from more than 6,100 interviews with enterprise IT leaders across 31 countries who have deployed private, public, and hybrid clouds in their organizations. We will also discuss the obstacles that organizations are facing to achieve greater cloud maturity. Cisco is helping customers translate the findings of this IDC study into personalized analysis and guidance through the Cisco Business Cloud Advisor framework. In addition, Cisco is launching a new set of Cloud Professional Services to help businesses navigate the ‘multicloud maze.’ Attend to learn how containers, microservices architectures and DevOps methodologies can really help you position cloud as a platform that powers your digital transformation strategies.